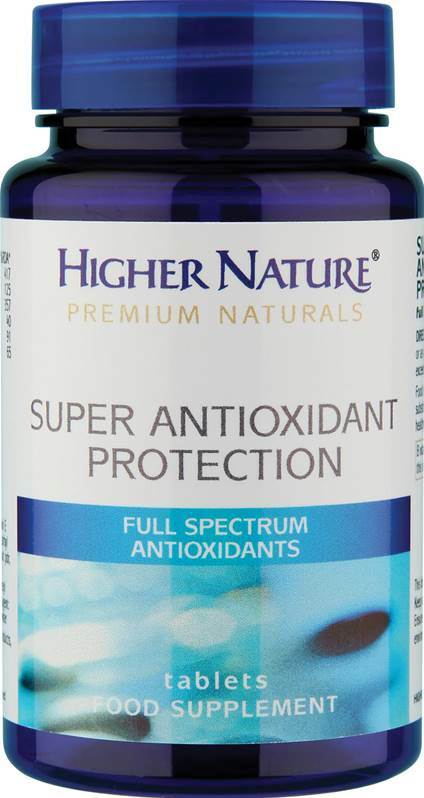 Higher Nature Super Antioxidants Protection is a powerful formula supplying key water & fat-soluble Antioxidants nutrients. Vitamins C & E to reduce oxidation in the arteries. This powerful formula supplies key water and fat-soluble antioxidant nutrients. Vitamins C and E work to reduce oxidation, especially in the arteries. Glutathione is precursor to glutathione peroxidase, the body’s key antioxidant enzyme. N-Acetyl Cysteine replenishes glutathione in the body, while Vitamin B2 helps its regeneration. Key antioxidant minerals Zinc, Manganese and Selenium support the body’s antioxidant enzymes. Contains Vitamin A. Do not take if pregnant or planning pregnancy. Contains nuts. 50mg Vitamin E, 100mg Vitamin C, 5mg Vitamin B2, 4mg Zinc, 50µg Selenium, 1.3mg Manganese, 2.3mg Beta carotene, 20mg reduced Glutathione, 10mg Alpha Lipoic acid, 5mg L-Cysteine, 5mg N-Acetyl Cysteine, 5mg Co-enzyme Q10, 10mg Bilberry fruit, 10mg Chicory root.